Welcome to The Milford Experimental Forest (MEF)! MEF is a 1,400-acre research located at the intersection of the Pocono Plateau of Pennsylvania and the Delaware Highlands of New York and New Jersey, which provide the closest wildland landscape to New York City. MEF, while owned by the Pinchot Family, is a joint project of the US Forest Service at Grey Towers, the Pinchot Institute for Conservation, the Grey Towers Heritage Association, and the Pinchot family. 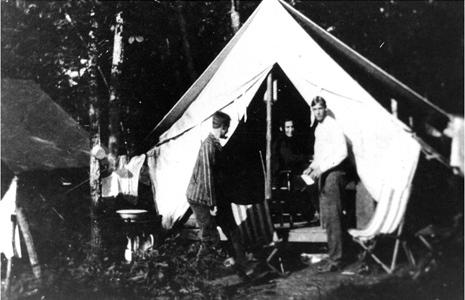 In 1901, while Gifford Pinchot was building the United States Forest Service, he and his father, James Pinchot established the Milford Experimental Forest to study methods to regenerate new forests in the aftermath of the widespread deforestation of the 1800’s. 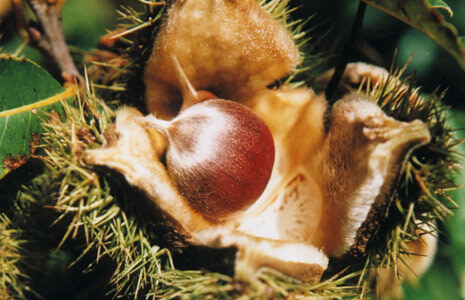 Research focused on the silvics (life history and ecology) and regeneration of different tree species as well as establishing red and white pine plantations. Additionally, for twenty-five years, MEF served as a summer field training program for Yale School of Forestry students. Many of our nation’s first natural resource leaders, including Aldo Leopold, gained their practical forestry skills – silviculture, surveying, dendrology – here at the Milford Experimental Forest. Both MEF and the Yale Summer Camp training facility were abandoned in the late 1920s. Seventy years later, the Pinchot family, in partnership with the USFS and the Pinchot Institute, reestablished MEF to continue the tradition of long-term studies in forest ecology and sustainable forest management. In 2006, thanks to assistance from the USFS’ Forest Legacy Program, the PA Department of Conservation and Natural Resources, and the Delaware Highlands Conservancy, 1200 acres of MEF were put in a conservation easement, permanently protecting the conservation value of this special property. The Forest Legacy Program is a national program coordinated by the USDA Forest service to support State efforts to protect environmentally sensitive private forest lands through the acquisition of conservation easements, legally binding agreements transferring a negotiated set of property rights from one party to another, without removing the property from private ownership. Most Forest Legacy conservation easements restrict development, require sustainable forestry practices, and protect other values. In the Gifford Pinchot tradition we pursue active stewardship of our forest through scientific management of its vegetation and wildlife. 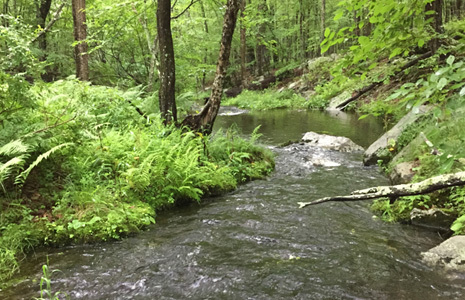 Well-managed forests provide numerous ecological services, including clean water, clean air, wildlife habitat, and carbon sequestration, as well as providing timber and other products used by society. 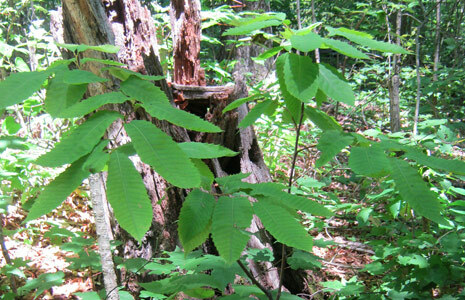 Current management and research themes at MEF include restoring a sustainable balance between the deer herd and the local ecosystems, improving wildlife habitat, and restoring species, such as American chestnut, and habitats, including grassland and shrub habitats, that are increasingly rare in the landscape. Mike DeGraw showing how antler size on MEF bucks has increased since the club started managing the deer herd in the mid-1990s. A major part of our efforts to improve the ecological health of our forest includes actively managing our overpopulated deer herd. To help us achieve this goal, The Schocopee Hunt Club practices quality deer management to produce a balanced deer herd through the appropriate harvest of female deer and management of food plots. 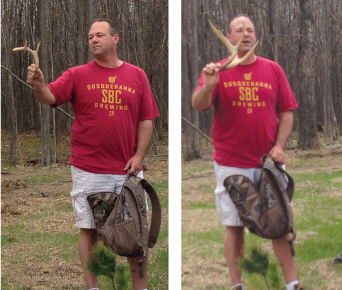 Only members of the Schocopee Hunt Club may hunt on MEF. MEF works with many collaborators to use our forest as an outdoor classroom for a variety of audiences, including school children, teachers, private forest landowners, forestry professionals, and interested citizens. 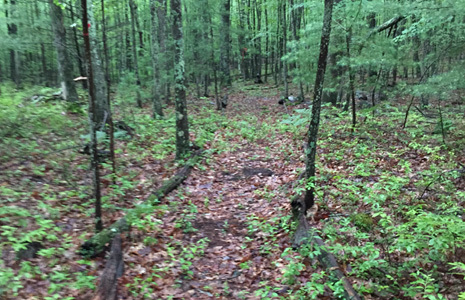 The trail is open to the public from dawn to dusk throughout the year with the exception of firearms deer season and spring and fall turkey hunting seasons, and occasional private events. Please check the PA Game Commission website for dates of deer and turkey seasons. Anytime you walk through the woods you may encounter dangers. Please keep your eyes peeled for rattlesnakes, bees and wasps, fallen branches, poison ivy, slippery rocks, and other potential risks. Ferns and Forestry BMPs Management: ecological imbalance due to deer overpopulation. 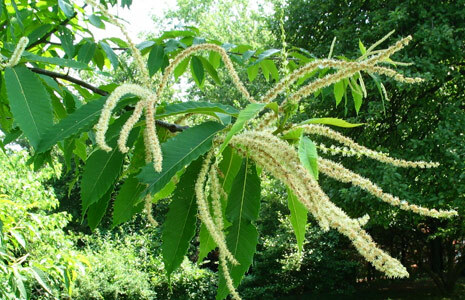 Leads to reductions in ecological and economic benefits of forest. 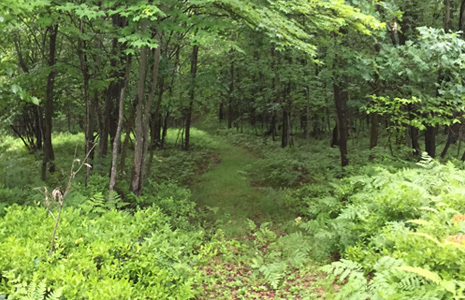 Food plots with hunt club: wildlife and forestry management.